I have officially released the next iteration of ScmDraft 2, 0.9. 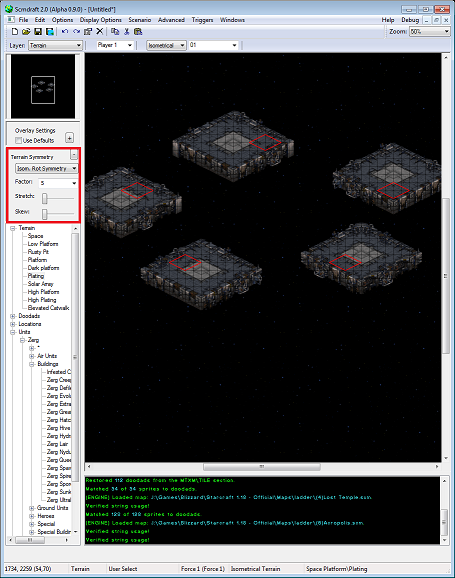 For those that do not know what this is, this is a StarCraft map editor with support for all the capabilities of staredit as well as all sorts of advanced features, such as extended ramps. The original ScmDraft 1 was a project I worked on during high school written in Dephi, released in 2001 and 2002. At some point I restarted the project switching to C++ and the first release of version 2 took place in 2003. Enhanced logging to simplify error reporting, available via -console command line or in the debug menu. 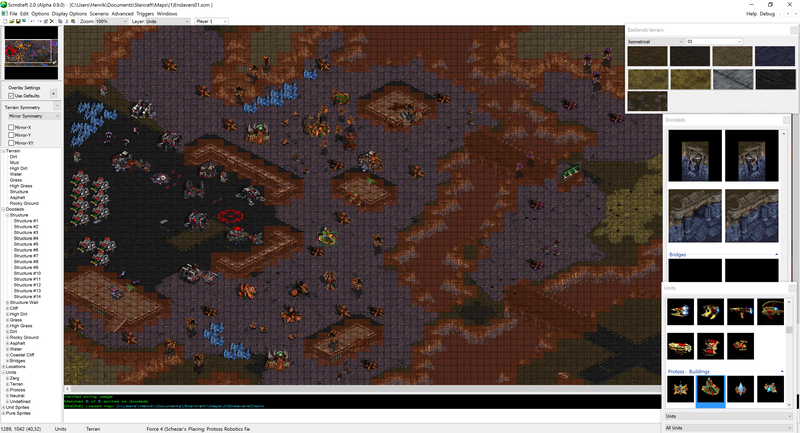 And just to forestall the most common question, does it support SC:R graphics? 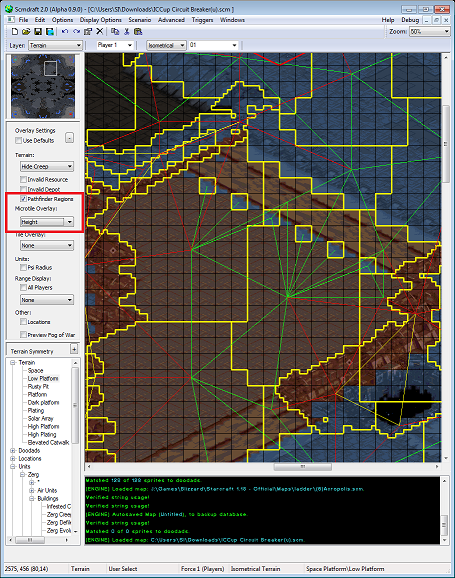 View Fullsized Rotational Terrain Symmetry. 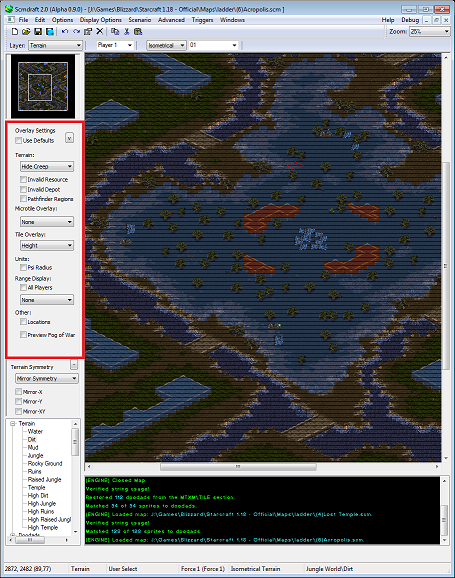 View Fullsized Pathfinding region preview, and terrain height display. View Fullsized Terrain height overlays. I haven't made a map in years, but I am excited that you are still developing scmdraft and I'll open it up this week to give the new features a test. When you say 'will it support SC:R' -- obviously the maps will work on SC:R just fine. I assume you mean having the ability to view the map/doodads/units/spells/etc as it would appear in SC:R? This looks fantastic. You get so much credit for still working on this piece of software after all this time. Without ScmDraft 2 the Brood War scene would be a very different place. I don't know much about map making, and I've only messed around with ScmDraft a couple of times. Does this update let map makers create some new things in-game? I don't know if there are any barriers like that left unbroken. Ya, I'm just referring to the HD graphics. Everything else is unchanged between SC and SC:R.
Mostly it makes a few things that were difficult to do/edit much easier, adds better/faster access to various editing layers and objects, and likely the most important thing is it includes various diagnostic views to find map bugs without needing extensive play testing. That's excellent. 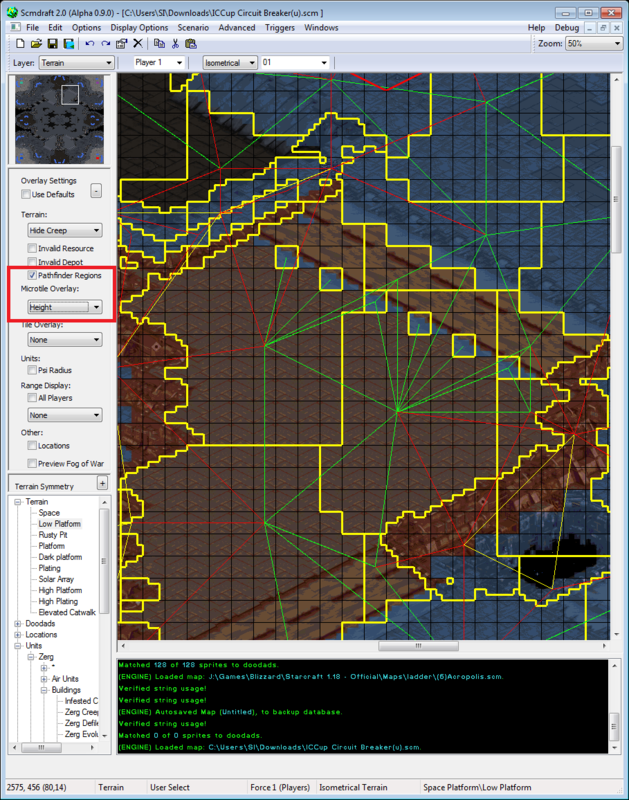 I know map makers have had to use third party tools and extensive testing to make sure their maps work right, especially with pathfinding and the like. I'm sure v0.9.0 will be a godsend for that. Can I donate you $20 for your work? I don't know if you accept donations anywhere. Wow! Thanks for this. I had no idea you wrote ScmDraft while in high school. I've always felt that it was a well designed piece of software and I've really appreciated working with it. If you have a google docs spreadsheet for bugs, feel free to post it here and I'll be more than happy to QA it. If not, I can I just make one up. wow great job. maybe u can find some helpers in here for the implementation of the SC:R graphics. Installation tileset is all unbuildable I think. You wouldn't be able to build anything anywhere. So far there have only been a handful of reported bugs and in general I could verify and fix em within a day. As long as the reports don't increase to a level I fall behind I think that's overkill. Man, it won't work on Linux, duh! I know and I asked this question because as far as I know Blizzard is willing to put resources to improve the map editor. With WINE it runs on Linux. I run it with WINE just fine (unlike SC:R D: ). Only some menu minimizations don't work and window scaling is a bit glitchy. The problem is not with the editor but with the game engine. Since so far it seems like Blizzard's "don't change gameplay" policy does extend to even serious terrain bugs (among some other stuff that effectively changes melee gameplay between 1.16 and 1.18++) I wouldn't expect this to happen. And even if, Installation is utter crap for designing melee maps for for lots of reasons. So on my list of priorities for possible improvement's from Blizzard's side this is far down. Weird posting glitch... Can be deleted.